I have been eyeing this gladius for awhile and finally bought one. I was very surprised at how nice this sword is. The Damascus steel hammering pattern is as good as some of my very expensive knives in this steel. It is well made, quite beautiful, the pommel is tight and solid, the inlay is well done, and I am liking it a lot. I wish the nut on the end of the pommel was about a 2-3" spike. Otherwise, get one! 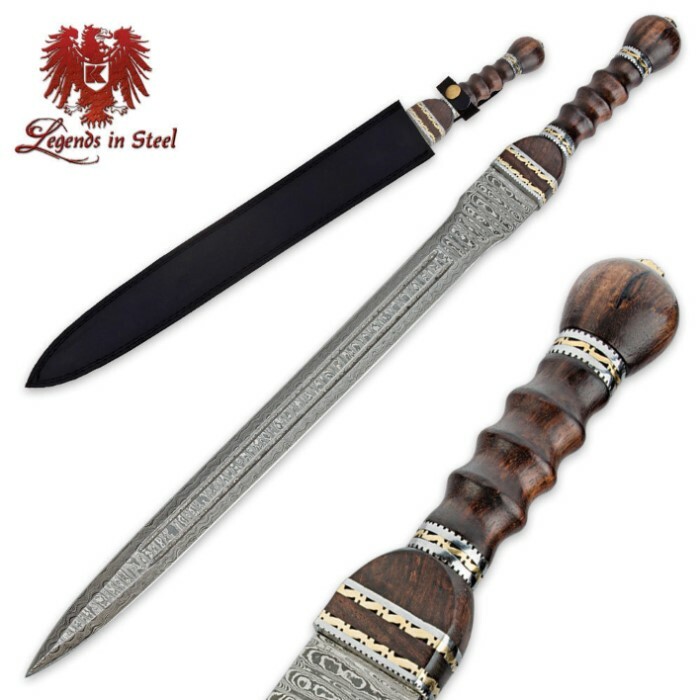 I just got 2 of these short swords today, as I had been shopping ebay for a decent short sword set. I was lucky enough to get both of these beauties for the price of one on a BOGO deal. 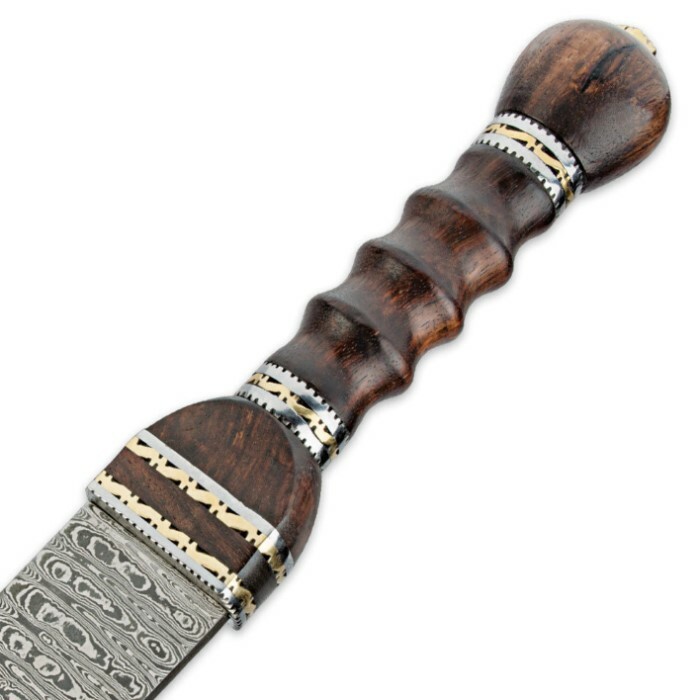 The pattern in the damascus is very desirable. These blades are excellent quality and I am very pleased with this purchase as I was expecting to pay around $300 for a set. Thanks BudK!!! Oh yeah, It doesn't say in the description but these swords are 25 5/8" from blade tip to pommel bolt. If you are thinking of ordering this fine item, do it, you won't be sorry. 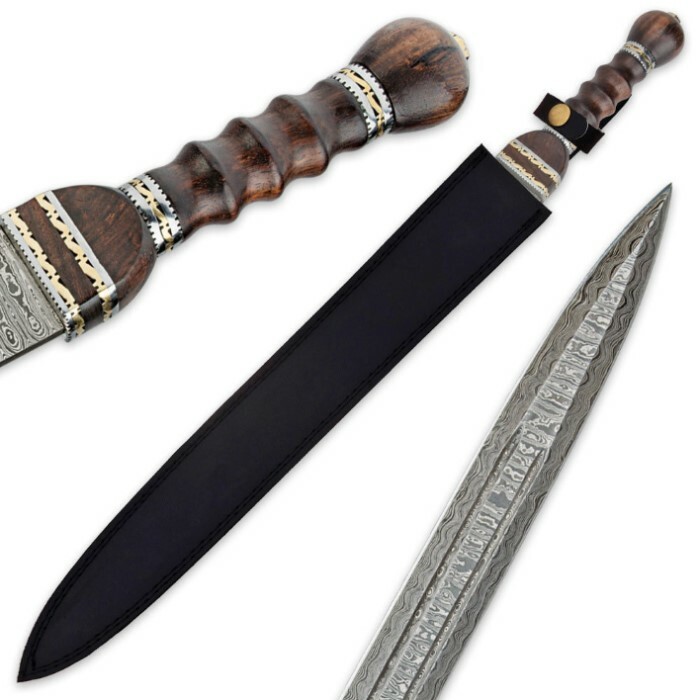 This is a nice sword the folded steel is not consistent between the two blades, as are the handles, and they have a rat tail tang. Nice weight swings well they came with a small amount of storage rust. The sheath is leather and the belt loop is very thin not sure this will last on a belt. It did come sword sharp and feels good in my hands I bought two (BOGO) this is a good sword for the money. Hope to use it in the field will up date my review as I go. I think it earned 4 1/2 stars for the rat tail tang and thin belt loop. Such a gorgeous blade. Excellent craftsmanship from exterior. Haven't tested its durability because I just cant bring myself to test the finish.Feels very solid though. Smaller and thinner than I expected but the wood and damascus is beautiful and comes sharp out of the box. Leather sheath is nice as well. Got a good deal with it shipped for $75 with the 30 percent off deal. Would definitely buy it again. I cant inspect the welding on the inside assuming it is welded to anything but I think it would hold up well enough to most things! Beautiful looking sword. Came well packed and sharp out of the box. No wobble yet, though I haven't tried to hack anything yet. Got it 30% off - helped balance off the higher shipping cost out here.